Tumblr is a visual blogging platform. When you first started out on social media, Tumblr may not have fit the description of what you were looking for. Today, you may be pleasantly surprised to discover a blogging solution where you can create engaging and diverse posts in much less time than other platforms, while also piggybacking on the social networking capabilities it offers. Given the A-Z theme of this article, blogs were chosen if they could represent one of the 26 letters. Due to the recent growth in Tumblr, its ease of use and wide-ranging possibilities, the blogs represented below are offered as inspiration. Recommended introductory and how-to resources for Tumblr are listed at the bottom of the article. Spoiler Alert: While Tumblr may speak to the issue of brevity on blogs, this post is a far cry from a brief post. In fact, it’s exceedingly long—hopefully, all the better to learn from! Links to Facebook, Twitter and their “A-List,” which is essentially a signup form to stay up to date on what’s happening at their hotels. Link from the homepage to reserve a room and check availability. Some businesses utilize the Ask Question feature on Tumblr. Ace Hotel calls it "Say Hello," where you can easily submit a private message to them. "We're here to point you to interesting stuff from our website, boston.com, our city, and our world." 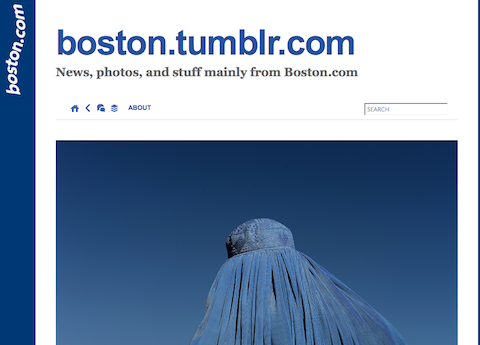 The photos on Boston Globe Tumblr are eye-catching and unique. Many are tagged “photojournalism.” Followers like their posts and reblog them. They also use social media share buttons on their posts so visitors can easily tweet, like or +1. One of the first icons you see on CNET‘s Tumblr blog is the “random post” button that makes the blog “shuffle” and display a random post each time a reader clicks it. They also utilize an archive feature that displays a visual archive of past posts by month. CNET uses the Solaris theme. 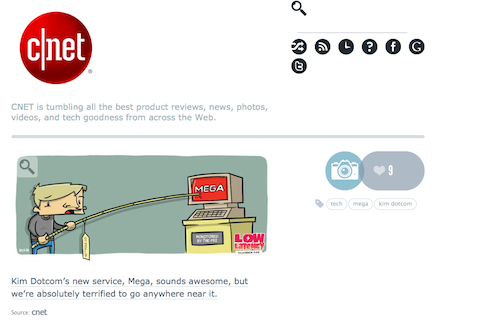 CNET also provides social media sharing links for Facebook, Twitter and Google+. Many times, their posts are photos with captions, and on occasion, an animated GIF. 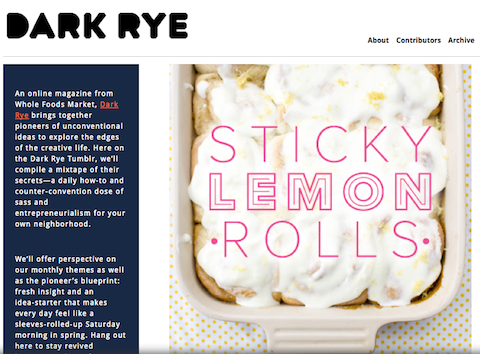 Dark Rye uses the Inspire Well Tumblr theme. 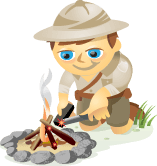 While many posts may include food-related content such as a granola recipe and Jamie Oliver’s Food Tube channel on YouTube, you’ll also find instructions for something you may have been wondering about, such as how to start a campfire. Elle Magazine uses Tumblr to showcase fashion highlights by using photos with captions. The captions refer to design companies with the “@” sign (e.g., @JasonWu). Elle tags photos with hashtags (e.g., #prefall) within the caption. Elle provides icons for their presences on Twitter, Facebook and YouTube. By clicking on the photos, you’re taken to elleusa, the official Instagram page of Elle Magazine—a great way to integrate Instagram and Tumblr. 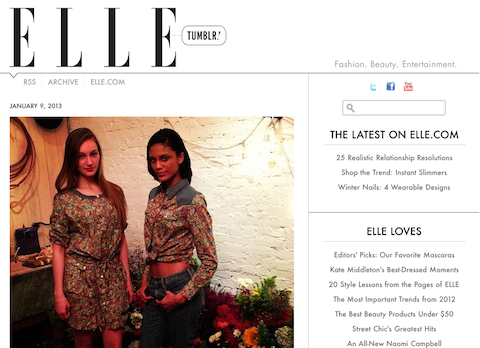 On the upper-right corner of their Tumblr home page, Elle provides icons for their presences on Twitter, Facebook and YouTube, as well as links that take you to the online magazine. There’s also a link to sign up for their newsletter and a button to subscribe to the magazine. 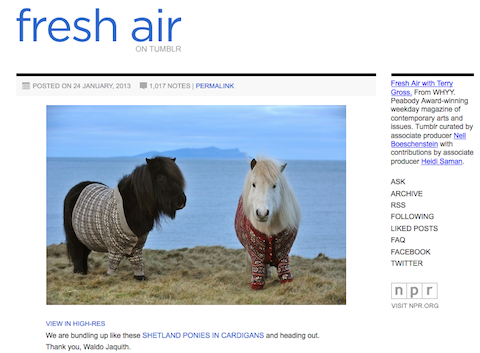 Fresh Air, the interview-format radio show with host and co-executive producer Terry Gross, has a Tumblr blog that is curated by associate producers Nell Boeschenstein and Heidi Saman. It’s a nice touch to reference on your home page who’s responsible for the curated content, since many times visitors don’t know who the behind-the-scenes voices are on social media sites. Many of NPR's posts are photos that you can also see as high-res images. Many of their posts are photos that you can also see as high-res images with a short amount of text (100-200 words) and posted videos and sound clips. Some other nice touches to Fresh Air on Tumblr are the Ask link where visitors can email the blog a private question, see answers to frequently asked questions, posts from other Tumblr blogs that Fresh Air liked and a list of who they’re following, all beautifully displayed in a long graphic of avatars that link to the blog. 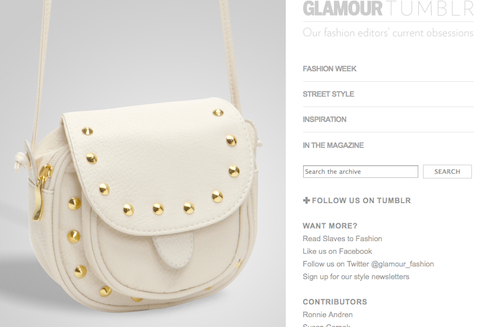 Glamour integrates photos on Tumblr with their presence on Instagram. In some posts, the Glamour blog uses the tag “glamour magazine” that shows photos from the magazine, links to the full article and in some cases, provides prices and a link to online shopping sites such as Maiden Nation and NCLA. Glamour, like Elle, integrates photos with their presence on Instagram. They also include the names of four contributing photographers and provide attribution to the photos they’ve taken. And regardless of the subject of the photos—bracelets, shoes, an archived picture of Princess Diana—the photos are beautifully done and you can easily see why their editors want to share them on Tumblr. 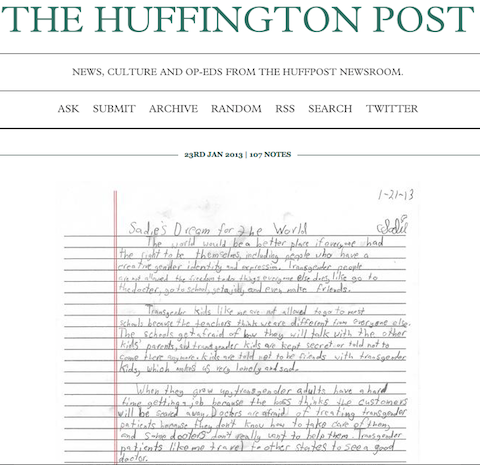 Huffington Post uses the Minimalist theme. Huffington Post uses a free theme called the Minimalist and users can see what the theme looks like and if they choose, they can also quickly update their blog to use the same theme. 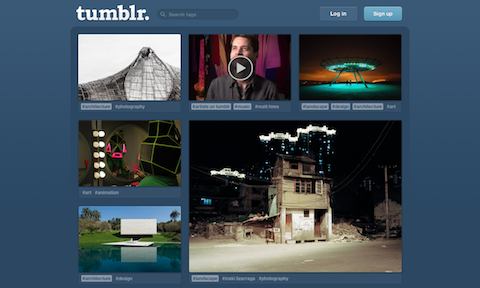 Tumblr themes have different features and characteristics. Sometimes even if a feature that you want isn’t available—for example, the Submit link where users can submit a post to your blog—you can customize the theme’s HTML code and make it functional. Many of the posts are newsworthy with photos, brief text and links. Huffington Post also uses the random post function and a link to their Twitter profile. IBM has three blogs on Tumblr. Their primary blog, A Smarter Planet, posts content related to “a planet that is instrumented, interconnected and intelligent.” Their secondary blogs, The Social Business and The Smarter Cities Scan, make it possible to have blogs with complementary content. IBM has three blogs on Tumblr. Primary and secondary blogs permit different features. For example, primary blogs offer full use of “Tumblr’s social features, including Follow, Like, Reply, Ask, and Submit.” Secondary blogs differ in that they can be password-protected; allow multiple users; and receive social requests (Follow, Like, Ask, Submit) from other blogs, but not initiate social features to other blogs. The posts on A Smarter Planet have social-sharing buttons enabled, making it possible to tweet, like on Facebook, +1 on Google+ and pin on Pinterest. The J. Crew Tumblr blog from all appearances has many of the features that we’ve come to love and appreciate from a WordPress blog, such as a blogroll in the side column that they’ve titled Cool Clicks. J. Crew's posts mostly consist of photos of their apparel with tips on how to wear and accessorize. The posts mostly consist of photos of their apparel with tips on how to wear and accessorize, and in some cases, they may include a link to their website where you can purchase a product you see in the photograph. But they use this very sparingly so you don’t feel like you’re on an online shopping website. Instead they are engaging readers with the styles and colors of their products. They’re also using a full spectrum of social-sharing buttons—Facebook, Pinterest, Twitter, Instagram, YouTube, Google+ and RSS feed. Kmart‘s Tumblr blog is one of the most different ones we’ve taken a look at so far, with a bare-bones look and feel. The focus here is on sharing coupons, deals and coupon codes—and selling. There are no photos, all posts are text only and contain the same four tags: kmart, coupons, deals and couponcodes. The links take users to shop on Contaya. 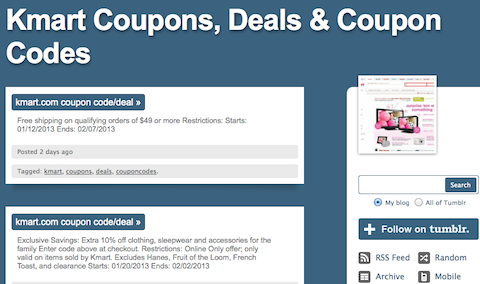 Kmart's Coupons blog focuses on sharing coupons, deals and coupon codes. They offer some of the features we’ve discussed previously about other sites (random, for example), but one of the distinguishing features of their blog is a mobile-friendly version. One of the first things you’ll notice on Lucky Magazine‘s Tumblr blog is photos—BIG photos—ones that can be as high as 1000 pixels and as wide as 800 pixels. Lucky Magazine's photos are linked to Instagram. You’ll find social-sharing buttons located after the tagline; many of the usual players we’ve seen before on other blogs. Although Lucky Magazine has also included a link to their presence on Foursquare. ModCloth describes their Tumblr blog as “Democratizing fashion one indie, vintage, & retro-inspired style at a time!” The company uses the Juuvy theme, “A fashionable chic modular grid with adjustable post sizes.” You can also customize the colors, fonts and background. The page is visually appealing with posts that contain photos and captions, and the ability to see the photos in high resolution, too. ModCloth uses the Juuvy theme. Their Ask feature offers a unique capability, too: the possibility to have your question featured on their feed. 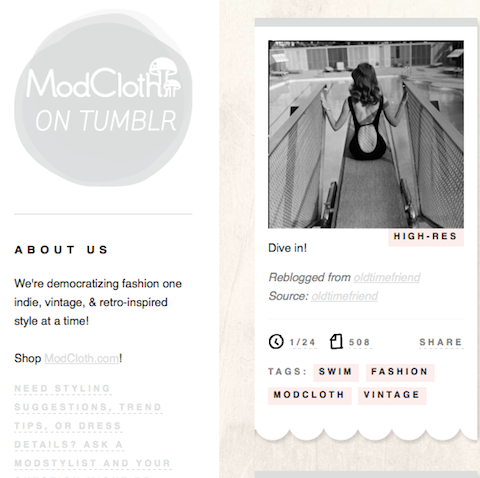 ModCloth uses some of the social-sharing buttons we’ve seen used by other companies. One we haven’t seen before on this list is a link to their Flickr photostream. By clicking on the Share button at the bottom of every post, you’re given the shortened URL, which is also a nice feature. 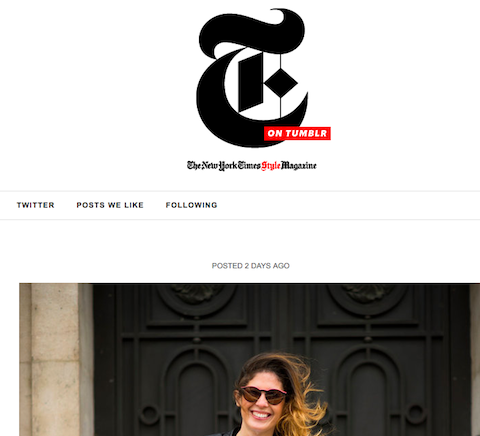 The New York Times Style Magazine‘s Tumblr blog is another example of one that uses large photos. Some may be as wide as 1020 pixels and as high as 680. The posts are generally photos with captions that consist of two to four tags. The links take users to the Style Magazine’s web pages. 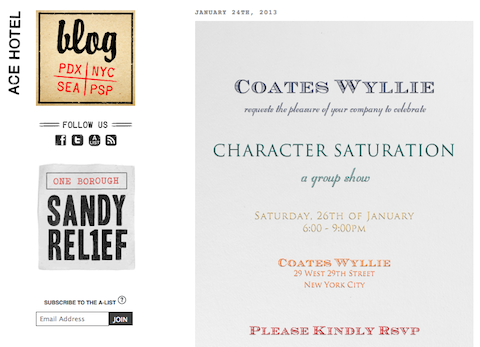 Links on the New York Times Style Magazine Tumblr blog take users to the Style Magazine's web pages. They utilize an RSS feed, archive, a link to their Twitter profile and who they’re following. There are share buttons from posts to Facebook and Twitter. 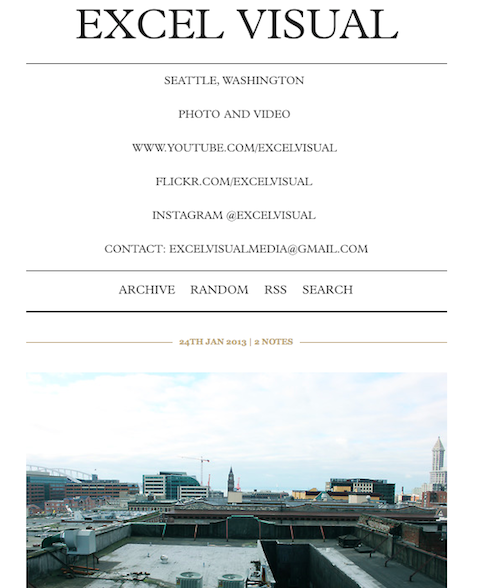 The blog is simple and clean. Oscar de la Renta's Tumblr blog relies heavily on photos and captions. This is a blog that relies heavily on photos and captions. A post may be showcasing fashion for Spring 2013, or bring back a photo from 1995. In either case, the photos generally speak for themselves. Some literally do, while others may have one word (e.g., “games”) or consist of 15-20 words at the most. Users can ask questions and follow on social sites. One network they make a point of emphasizing is following them on Pinterest, where they have a large following of nearly 50,000. 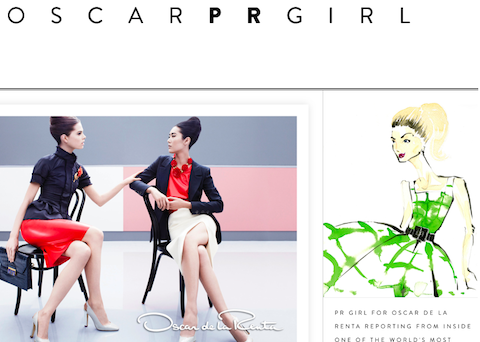 Pinterest and Tumblr work exceedingly well for Oscar de la Renta. Tumblr isn’t all style and fashion. Sites like Pew Internet will appeal to business users with the type of infographics and research findings that Pew Internet is known and respected for. At times they will ask a question within the post and provide an answer box where users can comment. Pew Internet uses the Minimal theme. Some posts include a link where users can read the full story on Pew Internet‘s website. One very cool feature is Browse All Tags, which is a word cloud of tags that stretches far down the page. There are links to their presences on some of the usual social sites. 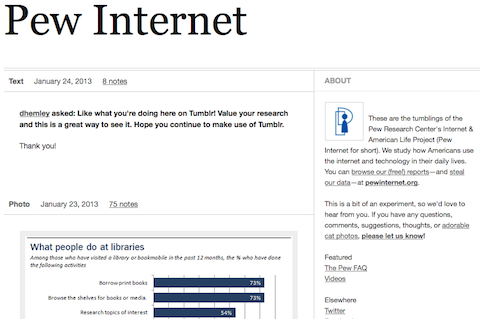 One that clearly is an important venue for Pew Internet, however, is SlideShare. GQ‘s Tumblr blog uses a mixture of photos and text that are generally tagged with four to five words, and always “GQ.” Readers may see the first three paragraphs of a story and if they click Read the Rest Here, they’re taken to GQ’s website. GQ's Tumblr blog uses a mixture of photos and text. 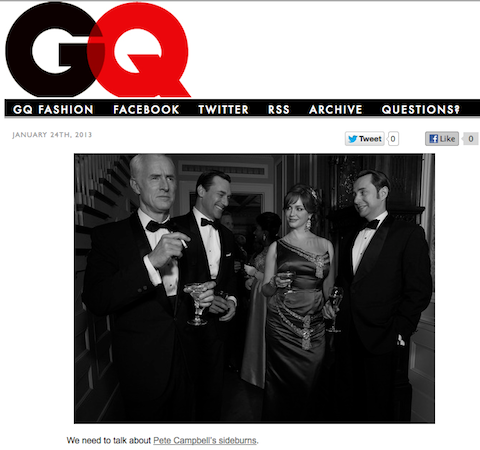 GQ also uses a secondary blog, GQ Fashion, that like their primary blog uses photos. But in this case the posts don’t include text from longer articles. Their purpose is to demonstrate fashion with brief, simple captions. The primary blog includes a link to subscribe to the magazine and another to get the apps on iTunes (but according to the error message, does not work in the U.S. at this time). Rocketboom, the daily international news and entertainment network of online programming based in New York City, has a Tumblr blog where photos can be anything from dogs in costumes to a photo of poet Sylvia Plath commemorating her birthday. 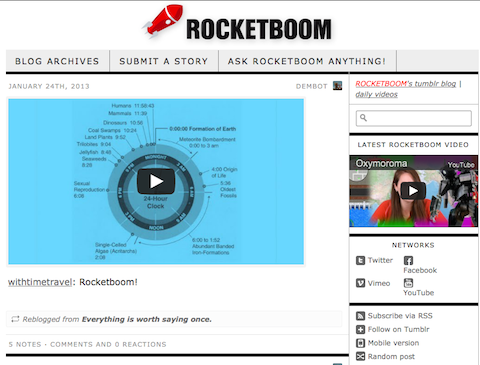 Rocketboom's Tumblr blog offers a mobile-friendly version. Posts may also include longer blocks of text, links to other websites and videos on Rocketboom’s YouTube channel. Rocketboom is also among a small number on this list that are using a mobile-friendly version of their site. Shapeways 3D Printspiration is described as a “3D printing marketplace and community.” They mostly use their Tumblr blog to show photos of their 3D products, often accompanied by a brief caption. The photos link to their Instagram account. 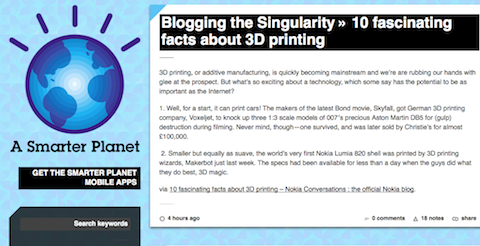 Some posts may also contain full-length text that links back to their other blog, The Shapeways Blog: 3D Printing News & Innovation. 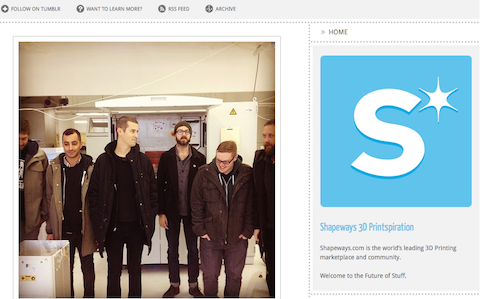 Shapeways is using the Single A Tumblr theme. Shapeways has presences on multiple social networking sites (Facebook, Flickr, Pinterest, Twitter and YouTube) and one of the notable features on their Tumblr home page is the ability to see a list of recent tweets in the side column. Tips for Architecture School is a Tumblr blog started by Mark Perrett, a designer, who uses his blog as a resource for people studying architecture or planning. 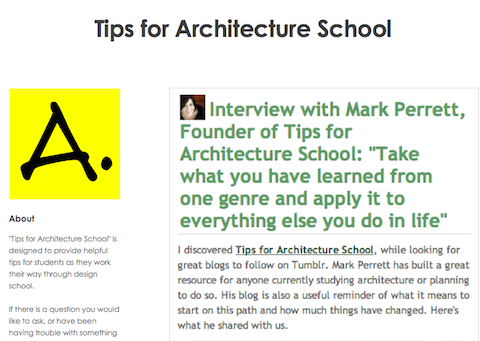 Tips for Architecture School blog is a resource for people studying architecture or planning. Even if we didn’t know that Mark loves blogs, I think it would be easy to surmise, judging by his answers via blog posts to people who ask him questions about an education in architecture. If he needs to do research to answer a question, he’ll post the link to the article and provide his own commentary on the subject. Mark exemplifies good use of the Ask feature on Tumblr, not only responding to the individual but also recognizing that other people would benefit by the Q&A which may appear on his page. Tumblr recognized the popularity of the Tips for Architecture School blog and has included a link on their Architecture spotlight page. Universal Music's Tumblr posts are short and to the point. Their posts are generally short and to the point, with photos, captions and links. In some cases, they’ll link to a musician’s Facebook page. Other times, they’ll let users know that they can listen to an album for free on Rdio. Their images appear to be directly entered via Tumblr and not housed on other sites such as Flickr or Instagram. 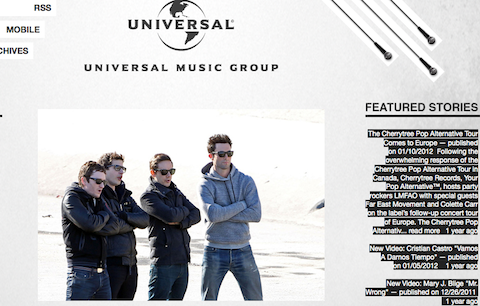 Universal Music provides links to their Facebook, Twitter and YouTube pages and also has a mobile-friendly version of their site. 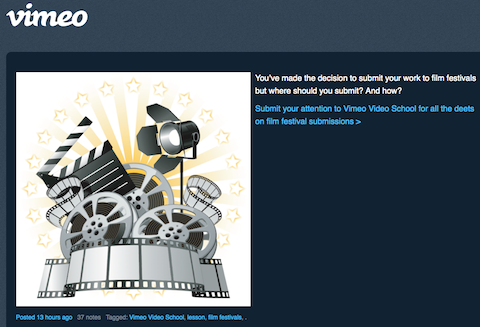 The Vimeo Tumblr blog uses the Tumblr bookmarklet. There are links to their presences on Facebook and Twitter. Videos are stored on Vimeo (no surprise!). One notable feature on their blog is the use of the Tumblr bookmarklet, which we haven’t seen used yet on any of the blogs discussed here so far. The bookmarklet is a button that users can drag to their Bookmarks bar and quickly share on their blog when they come across something interesting they’ve found on the site. 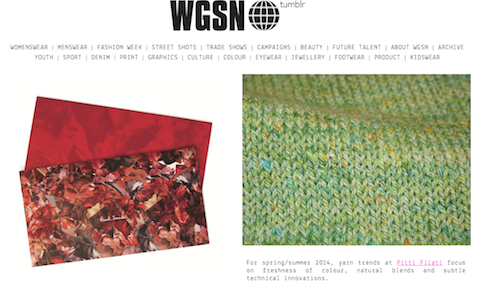 WGSN describes their work as “…world’s leading fashion trend forecaster. A must-have resource for design professionals around the world, we’re also now on Tumblr providing a live stream of the thought, insight and inspiration behind our work. WGSN's Tumblr blog is curated by a team of global contributors. What’s particularly refreshing about this statement is that it’s available via a link on the blog, About WGSN, which you may not think is a big deal. But surprisingly, many brands don’t have a good description on their page about who they are and what they do. Maybe it’s more an issue of the themes not providing a built-in way for brands to provide that information. The posts primarily contain fashion photos with one or two sentences of text, and some will link to a retailer’s website. In other cases, they may reference their annual report and link to their website. It’s interesting to note too that from WGSN’s website, we can see that they have presences on Facebook, Twitter and LinkedIn, but have chosen not to include those links on their blog. Excel Visual is the blog of a freelance photographer and videographer whose name is not present on the site. This blog was chosen for the article in part because it was the closest we could find to a name that began with an “X” (to be perfectly honest), but also because it demonstrates the work of a freelance businessperson! Excel Visual uses the Minimalist theme. While the URLs for presences on YouTube, Flickr and Instagram are presented in the header of the homepage, they are not active links. The gallery of photos is presented with one- to two-word descriptions, such as Shopping Assistance or Brisk. 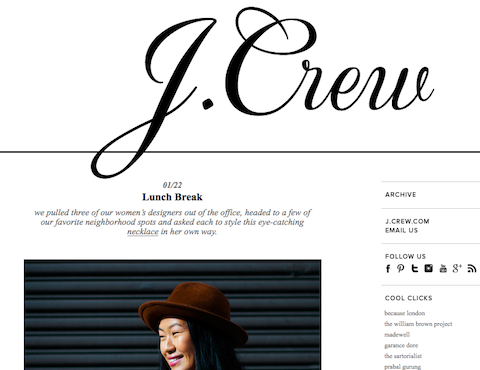 This Tumblr blog may well serve the purposes for the freelancer, who is using the Minimalist theme. The theme might not offer the other types of functionality we’ve discussed in this article right out of the box, but it is also customizable. 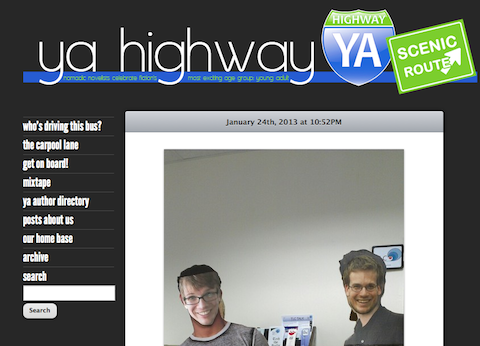 YA Highway is using the Brutal Simplicity theme. The blog contains posts about the writers, links to tips for writers (hosted elsewhere), a directory of writers in the organization and other perks such as links to music for writers. Zap2It‘s Tumblr blog focuses on “TV, celebrity and movies for fanatics by fanatics.” Posts include photos such as Beyonce at President Obama’s first inauguration party, remembrance of Martin Luther King, Jr., a picture from the TV show, The Office. 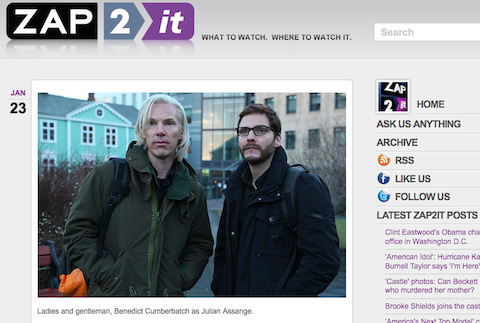 Zap2It's content style on Tumblr feels similar to a Facebook post update. Zap2It’s content style on Tumblr is very similar to a Facebook post update, with many posts ending with a question, minus the ability for users to respond to an individual update. Nevertheless, their questions are thought-provoking. 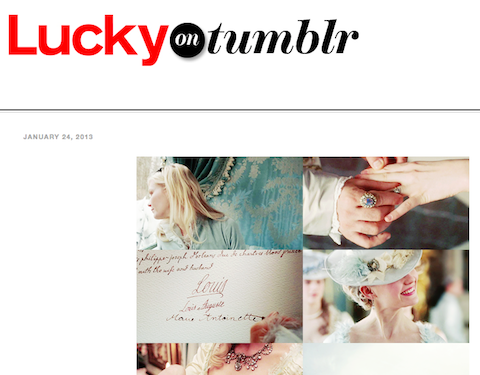 The Tumblr blog has links to their Facebook and Twitter pages. What do you think about Tumblr? Share your experiences and let us know if you’ve been using Tumblr and how it’s worked for you. Or, whether you’ll consider giving Tumblr a tumble. Leave your comments in the box below.